Cruise Talk: Carnival Mardi Gras To Offer First-Ever Roller Coaster At Sea CruisePage.com - Discount Cruises, Last Minute Cruises, Cruise, Cruise Line, Cruise Vacation. Get ready to ride! 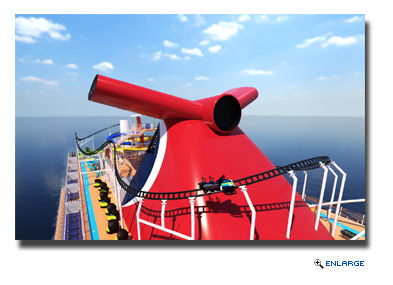 In another cruise industry first, Carnival Cruise Line's Mardi Gras will feature the first-ever roller coaster at sea when it debuts in 2020, providing an unforgettable and unique open-air thrill ride on the line's newest and most innovative ship. Built by Munich-based Maurer Rides, BOLT: Ultimate Sea Coaster is a heart-pounding rush of adrenaline offering nearly 800 feet of exhilarating twists, turns and drops with riders reaching speeds of nearly 40 miles per hour.